I remember hearing about this movie when I was in high school. Caught glimpses here in there, but never really watched the entire thing. You can imagine the appeal of this film to a teenage boy. A Man v. Wild type of documentary where the subject lives with bears. Grizzly bears. However, looking back, this film wasn’t so much regarded as it was laughed at. The film’s main, Timothy Tread well, was looked at in a fascinating yet rather degrading light. He was seen as crazy with numerous delusional ideologies. His exploits were praised because they were extreme and cool, but his ideas of nature and beauty were never really resonated. They remained hidden behind a facade of two Grizzly bears fighting or him slapping a bear in the face. This is not to say the footage brought to life is not breathtaking. On the contrary, the footage completes the story. It is just how we look at the remains of Treadwell’s legacy that may need some tuning. Fast forward some years and you get me actually sitting down and watching this film from start to finish. Taking in every word Treadwell had to say and every clip Herzog decided to keep in. Obviously the movie didn’t change, so I must have been the one to see things differently. Because things definitely were different as I remembered them before. Going into the film there was a sudden rush of anticipation. I was about to watch a man live with bears only an arm’s length away. The film did not disappoint. The very first shot shows two Grizzlies roaming a field with beautiful Alaskan mountains in the background. Our first encounter of Treadwell comes next. He enters the frame and sets the scene for the rest of the documentary. There is something different about him. He calls himself a “Kind Warrior” and in many ways he is. He fights for his life on a daily basis, challenging when challenged. However, it is the kindness that defines Treadwell. His compassion is to the point where we as the viewers start to feel unsettled. At this point, there are then two ways to look at Treadwell and approach this film. With disbelief and amusement or respect and wonder. Either way you will experience an entertaining film, but I would argue the latter will leave you with something more than just a film. Here is where my take on this film might be different from the typical viewer’s. Where you might see a documentary about bears, I see a love story. Take the time to ask yourself the simple question of “why?” Why did Treadwell spend thirteen summers in Alaska living with bears? Is he crazy? Is he trying to make a statement? Or could it be because he is actually passionate about the creatures he chooses to exist with. He shows us love for the environment around him. He believes his job is to protect the Grizzlies at all cost. He fights for them. Cries for them. Lives for them and ultimately dies for them. Treadwell shows us that a belief is not just a spoken word, but goes much deeper than that. 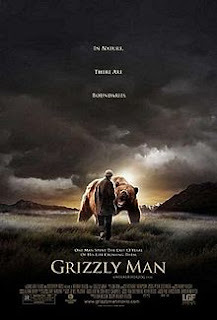 Death is often a good indicator of someone’s cause, but Grizzly Man proves that life can be just as worthy. There are many reasons to watch this film. I’ve given a couple examples of mine. The passion of a man. The romantic aspect of nature. But if not for these reasons, watch this film for the adventure. Watch it for the footage. For the bears. Watch it simply because you are a Herzog fan or a fan of documentaries. Find a reason and run with it. I implore you to watch this film. As the credits roll you will think back and try to remember all the moments you enjoyed. Through all the grit, death, and obscenities, there remains a flow of grace that is Timothy Treadwell.